We seem to live in an anti-anti era, and as a historian, it’s important to be highly sensitive to “actors’ categories” describing and classifying ideas and issues in ways people themselves used. This is why some historians of “science” and “religion” have argued against using those terms to describe human activity in the ancient world, or in non-Western cultures. At the same time, respecting actors’ categories does not mean giving historical figures license to define their own legacy. Hindsight and context allows historians to observe the larger trends that individuals are part of, even when people at the time couldn’t see them. At the intersection of these two concerns—how to avoid anachronistic intellectual categories, and the rhetorical reluctance to label oneself as “anti”—comes a major question for historians of science and religion. (How) can one speak of “antievolution”? Does using the term imply a bias, suggesting a group is wrong? Is it unfair to use the term antievolution, if those described as antievolutionists object to the description? Does the term represent a singular intellectual position, or does it unfairly lump together disparate movements that should be treated as separate? To describe people as antievolutionists is to identify them more by what they don’t believe than by what they do. Such a description implies that their positive claims are in fact secondary to their negative ones, that their primary concern is not to promote their account of life but to cast doubt on evolution. The label also suggests a commonality of cause between these groups and implies, sometimes rightly, historical and intellectual linkages between them. The term “antievolution” differs from some of these other “anti” positions in that it is a historically accurate actors’ category. There was a movement that identified itself as “Antievolution” (which, as Klinghoffer notes, was the subject of my first book). Using the term antievolution to describe that movement and its successors could be seen as a rhetorical sleight of hand, one which suggests intelligent design has a lack of philosophical or scientific validity. However, using the term in historical and cultural analysis makes a different kind of claim. In this context, the claim is about the movement’s intellectual, legal, and social continuity, with earlier forms of self-identified antievolutionism. This second use is not an attempt to win a debate about whether ID is right or wrong, but to draw a conclusion about how it fits into a longer history of American social movements in education. It was not considered so bad to be an anti-something in earlier eras of American history. For example, the American Anti-Slavery Society, established in 1833, was one of the most vocal organizations for abolition. In the early twentieth-century America’s prohibition of alcohol consumption was accomplished through the efforts of organizations including the Anti-Saloon League. Furthermore, an animal welfare organization in Chicago still retains the name Anti-Cruelty Society from its late nineteenth-century founding. Historically speaking, there’s no doubt that some antievolutionists also embraced “anti” terminology. One of the most iconic photographs is featured at the top of this page. Taken during the Scopes evolution trial in 1925, the photo shows the evangelist T.T. 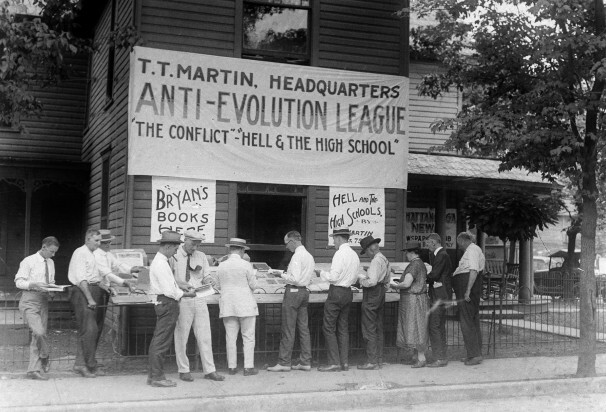 Martin’s stall outside the courthouse, where he is selling copies of his book Hell and the High School under the banner of William Bell Riley’s “Anti-Evolution League.” Five years before this photograph was taken, Martin also established the Anti-Evolution Society of America. In 1920’s America, then, people had no problem calling themselves antievolutionists. This leaves an interesting question for historians: when and how did this rhetorical identification change? One prevailing interpretation is that this change closely followed legal developments related to the teaching of evolution in American schools. In 1968 the U.S. Supreme Court ruled state laws that prohibited teaching evolution, on the grounds that it conflicted with the Bible, were in violation of the U.S. Constitution. After this ruling it was not legally possible to advocate for antievolutionism. Emerging soon after, were laws demanding “balanced treatment” between “evolution science” and “creation science”. The historical question of interest is not whether creation science is a science or a religion, but whether advocates of balanced treatment laws actually intended teachers to present both accounts, or whether they reasoned that this law would prompt most teachers to avoid the subject altogether. In the trials that contested these laws in the 1980’s, the argument was made that the law wasn’t merely an effort to promote biblical creation, but that it was really a means to ban evolution without legally prohibiting it. It was, in other words, stealth antievolutionism. Major histories of this trajectory are more likely to use the terms Creation or Creationism than antievolution. That phrasing however, begs the question of whether intelligent design is inherently the same as (religious) creationism, which the Discovery Institute strongly disavows. “Antievolution”, then, is a term that shows points of historical continuity without asserting that the character of antievolutionism has not changed. Put succinctly: antievolutionism evolves. Historians and legal scholars have substantially demonstrated that there are social and historical connections between the creation science movement of the 1980’s and modern day intelligent design. That doesn’t mean that the theories associated with modern ID are the same as those of creation science, or that ID is or isn’t a science, or even whether it’s religious or not. One might even accept, for the sake of argument, that intelligent design supplements some evolutionary accounts, rather than opposes them (though many would dispute this). Those issues are matters of debate amongst scientists, philosophers, and theologians. But the question of the social origins of intelligent design advocacy is historical. Is intelligent design intended to—explicitly or not—diminish the teaching of evolution? Is it, within that historical continuity, therefore a form of antievolution? Legally, the current state of intelligent design advocacy is not explicitly intended to prohibit evolution. The “academic freedom” laws that the Discovery Institute has advocated don’t explicitly prohibit anything. The Discovery Institute and some of intelligent design’s other advocates are careful about the distinction between presenting intelligent design and endorsing religion, distinguishing ID from overtly religious creationism, and they are even careful about the distinction between permitting ID and removing evolution. It is, however, a matter of record that there are often disconnects between what state laws permit and prohibit, and what actually happens in the classroom. So the real question is, whether such academic freedom provisions contribute to antievolutionism in practice? There are examples of teachers and school districts stating that they are promoting intelligent design as a scientific alternative to mainstream evolution, who in practice use the rhetoric of intelligent design to promote overtly religious agendas and thus practice antievolutionism. Is that a predictable, but perhaps stealthily intended consequence, of intelligent design advocacy? Some people have certainly made this case. My intention in this post is not to argue whether intelligent design is or isn’t true, whether or not it is scientific or religious, or whether it’s the same as creationism, or whether the theory as expressed is inherently opposed to the prevailing scientific theories of evolution. My aim is to consider the role of the term antievolution as a historical category. To do so, one must understand “antievolution” not just to refer to a specific negative claim (that biological evolution is wrong) but as a social movement whose origins were rooted in people who identified with that claim. It’s a social movement with articulated political goals, and considered in this way, antievolution is a label that allows one to identify historical continuity. It may even be that antievolution as a social movement no longer exactly matches the intellectual claims presented at its instigation, but in the history of social movements, it’s not uncommon for names to become detached from their original meanings. There is a danger in interpreting the historical category “antievolution” through the rhetorical cynicism of a present-day mind-set, which finds the label of “anti” inherently demeaning and a biased means of avoiding debate. Despite this, to deny its use as a historical category is to re-frame history, to imply that modern intelligent design has no historical connections with the generations of unashamed antievolutionists who came before it. 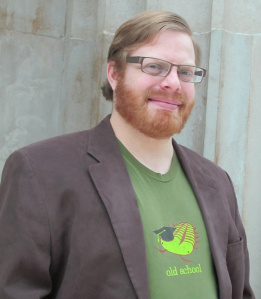 Dr Adam Shapiro is a Research Associate in the Science, Religion and Culture program at Harvard Divinity School and the author of Trying Biology: The Scopes Trial, Textbooks, and the Antievolution movement in American Schools.